Just wanted to show my build. Started it up finally after years since it ran. For some reason videso on Vimeo won't play for me. That has to win some kind of award for shortest run from turbo to intercooler! Oh no, a filter is a must, 2nd pic has the filter on. When the bumper was put back on the car there was no space for the filter. But we made a hole in the bumper and ran a pipe and now the filter sits in front of the bumper. A bit ugly but gotta keep that turbo clean. And is indeed a racecar. Only intended for drag racing. I have no idea how they say it. That's why I put it that way. stock big port head. Has nothing done to it. I have another spare head that I am going to send out to get build. Wanted the car to run. Already been a year since it last ran. Wanted to run it asap. Tired of sitting and watching everybody else race. car hasn't been dyno'd yet. due in 2 weeks. still have small things to work out on the car itself. i'll let you know how much it made once it has been dyno'd. A beast in the making. what is your ET goal ? Stock head with stock valvesprings.... ok for big boost ? what redline ? Wouldn't the same setup in a RWD, leave and ET considerably quicker ? ..or is the required gearbox adapt & diff swap, the deal breaker ? 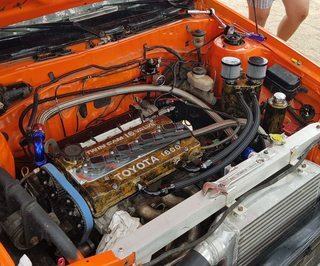 we changed the spark plugs, cleaned the injectors again..
tuner recommended k20 coils... so gonna get some of those..
i'll post another update when it's ready..
What was the spark plug gap? Davegt27 wrote: What was the spark plug gap? Then again at 0.13 and still had the same problem. How do you like that fuel tech ECU? Just heard about them recently and it looks like a pretty impressive computer. GZE_RA21 wrote: How do you like that fuel tech ECU? Just heard about them recently and it looks like a pretty impressive computer. Well it's doing it's job pretty well. No need to carry around a notebook to check datalog. You can see everything on the screen. You can make changes on it from the screen. You can see all the data you need. No need for gauges. Everything is on the dash. And they just released 2 new ones the ft450 and the ft550. Thinking of upgrading to the ft450. It has more inputs and outputs.